The Academy Award nominations can drive you crazy between the snubs and the needless accolades. Some years are so bad, you may think you’ll never forgive them. But every year, however misguided their big ticket nominations, the academy does at least one wonderful thing. They draw attention to short films that would otherwise go unnoticed. Do yourself a favor and head to the Gateway Film Center to catch all fifteen of these magnificent short subject works of art, including these 5 fascinating documentaries. A reformed skinhead who spent years addicted to violence, and the gay man he beat nearly to death, form an unlikely bond in an ironic setting. The title sells short the elaborate caves excavated by sculptor Ra Paulette. He’s driven to the point of defying his own patrons, and you simply won’t believe the structures that come from this one man’s obsession. A tragic day of protest in Yemen is chronicled through heart-wrenching interviews and breathtaking first-hand video. Simply stunning. 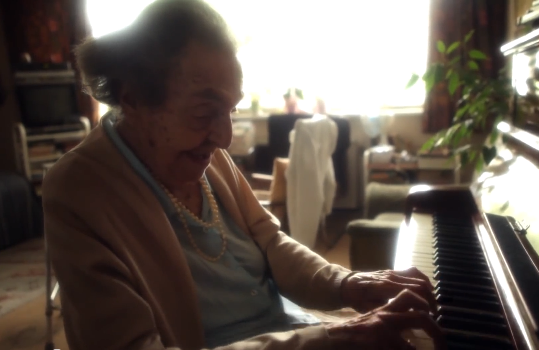 You will never forget 109-year-old Alice Sommer, the world’s oldest Holocaust survivor who continues to entertain on the piano. Her relentless optimism, even in the face of the most tragic consequences, will reduce you to mush. If this film tied for the Oscar with Karama Has No Walls, we’d be happy. Debuting March 31st on HBO, this is an intimate look inside a prison hospice system, and the final days of a convicted murderer. Director Edgar Barens succeeds in finding both hope and humanity within a stark, unforgiving subject.